The local Mandean community will host the next meeting of the Iraqi Council for Interreligious Dialogue on April 26. These meetings between Shiite and Sunni Muslims, Christians, Yazidis and Mandeans are a genuine achievement in a country where inter-communal mistrust is the general rule. Forty people joined the last meeting of the Iraqi Council for Interreligious Dialogue hosted by the Chaldean Patriarchate of Baghdad on March 1. They included Sunni and Shiite Muslims, Yazidis, Orthodox and Catholic Christians as well as Mandeans and even an audacious few of no religion. “Together before God to eradicate fanatical discourse in the name of religion” provided the day’s theme of discussion. Although it is now rare for members of different ethnic and religious communities to meet together, the discussions were “very frank and very free,” several participants reported. With his usual frankness, Chaldean Patriarch Louis Raphael Sako of Babylon, who hosted the meeting, raised several challenging questions. “On Judgment Day, will God ask us whether we are Shiite or Sunni Muslim, Catholic or Orthodox Christians, Mandeans or Yazidis? The question God is likely to ask us will rather be ‘What did you do for your brother? What did you offer your people?’” he said. The next meeting of the Council, which is scheduled for April 26, will be hosted by the Mandean (or Sabean) community. The Sunni community will host the May meeting, which will fall during the Muslim holy month of Ramadan and participants will break their fast together. 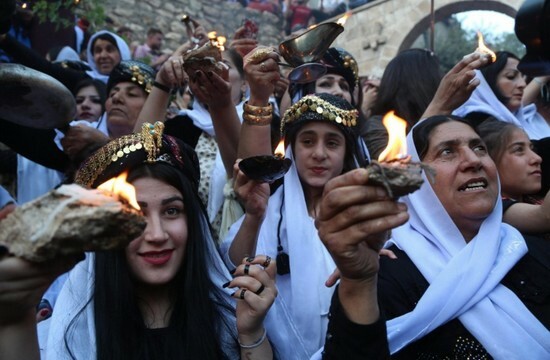 Then it will be the turn of the Yazidis to host a meeting, a highly symbolic occasion for this multi-millennial religion, which was undoubtedly the most persecuted by ISIS. “Five years ago, it was far from certain that people would accept to be seated at the same table,” said Sayyed Jawad Al-Khoei, who founded the Council with Dominican Father Amir Jaje. A Shiite, Jawad Al-Khoei, who is secretary-general of an institute for training in Islamic sciences at Najaf, particularly recalled a significant meeting in which ten women from various communities were invited to share a meal. “One of them cried. She told us ‘I am here with you seated at the same table but my child has been rejected by his classmates who called him a kafir (unbeliever),” he said. In Jawad Al-Khoei’s view, the creation of the Interreligious Council has had a direct impact on the Iraqi crisis. “We did not have any major ambitions except to break down the barriers between us or to agree to share a meal together when many regard this as impure,” he said. “Once we are able to identify the main problems, we will contact the NGOs to work with them,” he said. In an effort to build confidence, the Council meets behind closed doors and declines aid from government or from political parties. In another oddity in a country where honors are often sought, the group has no president, treasurer or secretary. How do the highest Iraqi Shiite authorities look on the initiative? “As soon as you do something in Iraq, you are criticized,” said Jawad Al-Khoei. Ignoring the opponents of interreligious dialogue, the Council seeks to rely on the “silent majority” of the Iraqi community. “If, at worst, jihadists represent 2 to 3 percent of the population, those who are opposed to violence represent a far greater number,” Jawad Al-Khoei said. “Most Muslims have no problem with Christians or Yazidis but they simply do not know them,” he said. “We need to show them that dialogue is possible and that religious leaders guide them in this direction,” Jawad Al-Khoei said.